WASHINGTON — NASA on July 19 released a draft solicitation for the fourth and final development phase of its Commercial Crew Program, which is still expected to result in a crewed space launch to the International Space Station from U.S. soil by late 2017, according to the document. The Commercial Crew Program is a NASA effort that subsidizes commercial development of systems to ferry astronauts to and from the space station. According to the draft solicitation, there would be two such flights per year, once NASA places its first task order for a crewed flight. Before NASA releases the final solicitation this fall, the agency will host a pre-solicitation conference with industry at the Kennedy Space Center in Florida on Aug. 1 and 2, according to the draft. As expected, the contract will be a fixed-priced deal administered under the Federal Acquisition Regulations. So far, NASA has mostly relied on funded Space Act Agreements to subsidize development of commercially designed spacecraft. While the competition is nominally free and open, it is generally believed that the companies with the best chance are those NASA is already funding as part of the third round of the Commercial Crew Program: Boeing Space Exploration Systems, Houston; Sierra Nevada Corp.’s Space Systems of Louisville, Colo.; and Space Exploration Technologies (SpaceX) of Hawthorne, Calif.
Boeing and SpaceX are working on capsules, while Sierra Nevada has a lifting-body design. All three spacecraft could seat seven people. Boeing and Sierra Nevada plan to launch aboard United Launch Alliance’s Atlas 5 rocket, while SpaceX plans to use whatever iteration of its own Falcon 9 rocket is in operation in 2017. 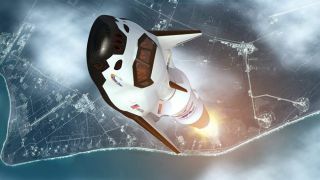 If the schedule and funding hold, the planned demo flight — part of what NASA is calling the Commercial Crew Transportation Capability Contract — would be the first crewed orbital spaceflight launched from the U.S. since 2011, when the space shuttle program ended. NASA has repeatedly said it needs more than $800 million a year — hundreds of millions more than Congress has ever given the program — to meet the 2017 date and keep more than one company involved with the program. You can read the full Commercial Crew Program draft solicitation here. This story was provided by Space News, dedicated to covering all aspects of the space industry. Follow us @Spacedotcom, Facebook or Google+. Published on SPACE.com.